Sledge o’ matic– For this Overhaul finisher you need a sledge (the heavier, the harder), an old tire, some heavy dumbbells (or saws from the truck) and an interval timer set to 30 seconds of work and 30 seconds of rest for 10 intervals (10 minutes total time). 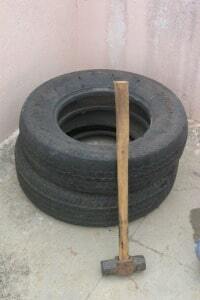 Take the sledge and slam the tire for 30 seconds, then rest for 30 seconds. For the next interval, grab two saws or heavy dumbbells; walk (with a purpose) for 30 seconds, after the 30 seconds is up, place the weights down and actively rest for 30 seconds. Repeat each interval 4 more times. Use different swing positions with the sledge and slam interval (right side, left side, overhead). I feel that these Overhauls realistically simulate the exhaustion felt on the fire ground and rescue scene. I know that there are tons of ways to perform these Overhauls and challenge you to come up with your own. If and when you do, I would like to know about it so please email me your ideas.